Have a wonderful Thanksgiving Oskar! And a super weekend – with such a fabulous blanket, you will have one, I’m sure! Happy Thanksgiving pal. 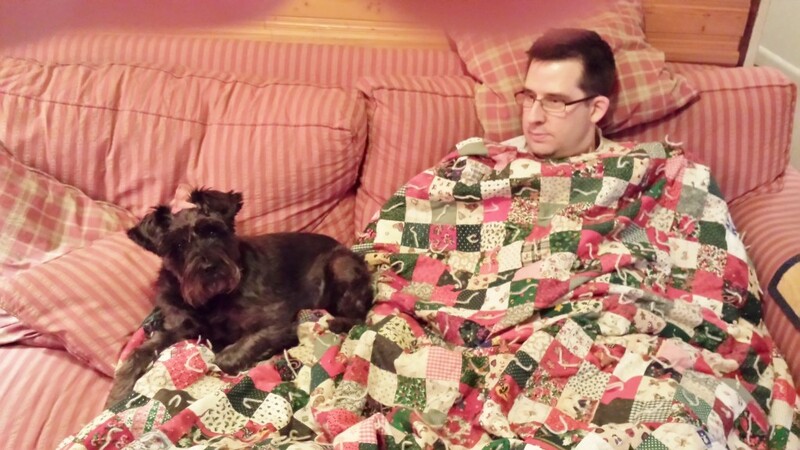 I love that blankey that you and your dad person share. It sure looks toasty warm. The Christmas Quilt…yay!!!! Remember NO CATS ALLOWED! Hope you get lots of treats, Oskar. We hope your staying snuggy under that quilt, and that lots of blessings come your way! We hope you had a wonderful Thanksgiving, Oskar! We LOVE snuggling on quilts! Oscar we hope all of your peeps are doing ok. We saw the post on the other blog and hope your mom is ok especially. We hope she heals forever. Enjoy that quilt and all those snuggles. All of our blogville pups are so lucky to have such wonderful snuggly homes. Have a loving and happy time together. Right back at you Buddy!!!!!! I miss seeing your handsome face!!! Love ya!!!!!! You look so comfy with your dad, hope you have a happy festive season! We hope Buchi gets better this Christmas. He’s had a really bad mange, bacterial and fungal infection since June. It’s partially why I haven’t been as active in bloggyville. Merry Christmas Oskar! I am glad you got some snuggle time with your dad.